My first post… thought it should be about food, of course! I will promise to take better pix, but this is my first post, so please cut me a little slack. On a visit to Los Gatos to see my folks one weekend, we went to this amazing little italian restaurant in Campbell that had opened recently, Tigelleria Organic Restaurant. Everything was amazing, but what I’ve had to attempt to recreate was the spinach salad. It was so simple, but so full of flavor! 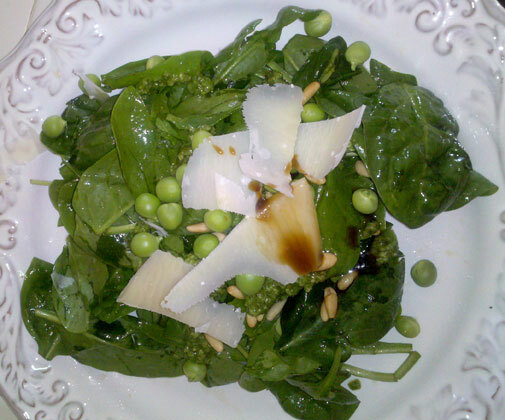 Baby spinach tossed with a light vinaigrette dressing, drops of pesto around the dish, fresh peas, shaved parm and a really really good balsamic dripped over it. I think the real trick here is the homemade pesto and the balsamic vinegar that you use. I also recommend a quick blanch of the peas, keep them crunchy, but a quick hot water bath never hurts. The light vinaigrette was just a splash of EVOO, fresh lemon juice and some S&P. Throw it all into a blender and add olive oil until it’s a nice consistency. Stack it all on a salad plate and voila! 1 Response to My first post… thought it should be about food, of course!